Sayon Syprasoeuth stands in front of artist Dave Van Patten's works at Cam Town Art Gallery at United Cambodian Community. January 28, 2019. Photo by Thomas R. Cordova. Next door to Lee Heng Market on Anaheim Street, there’s an orange-colored building with Khmer lettering above its second-story windows. An open door just around the corner on Dawson Avenue takes visitors up the staircase to the modest offices and classrooms of United Cambodian Community, a nonprofit organization serving what’s estimated to be the largest concentration of Cambodians in the United States in Long Beach. Upstairs in one of the meeting rooms, 29-year-old artist and UCC intern Annie Nak sits at a long table sketching out a character she said she hadn’t named yet, while local arts coordinator Sayon Syprasoeuth frames a few of her richly colored drawings. 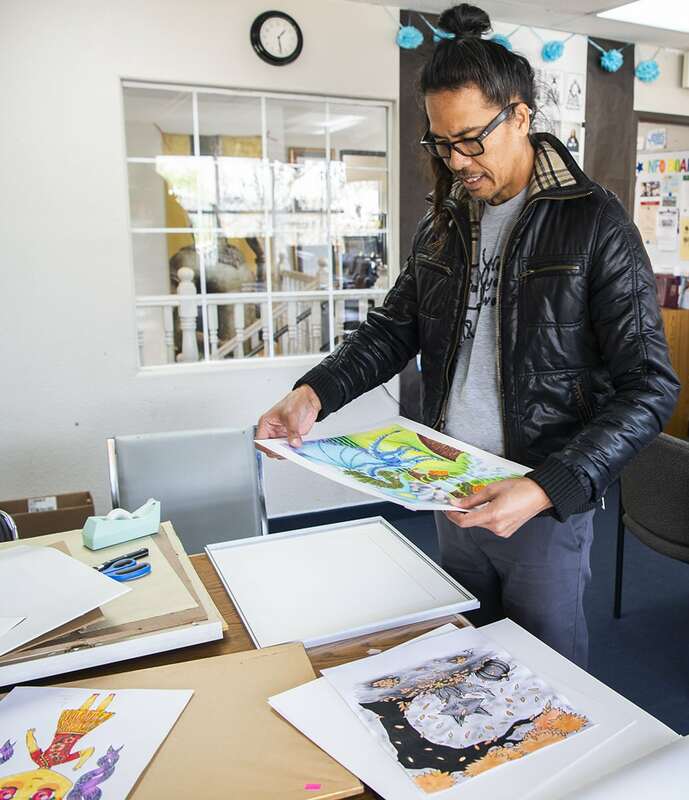 Sayon Syprasoeuth frames art for a show at Cam Town Art Gallery at United Cambodian Community that will support local artists in Long Beach. January 28, 2019. Photo by Thomas R. Cordova. Nak is the featured artist in the first exhibition of Cam Town Art Gallery, Syprasoeuth’s vision for showcasing the work of Cambodians, minorities and artists of color. Opening this Friday, Feb. 8, attendees may think at first glance that the “gallery” is just a homely hallway, but the project’s initiative goes beyond its physical circumstances. “With the genocide in the mid-to-late seventies a lot of the creative types and just folks in general that were educated, many of them were nearly wiped out, and for practical reasons, a lot of the parents don’t really encourage the kids to go into art,” Syprasoeuth said. Syprasoeuth hopes to change that. An artist in his own right, his work over the years has been about inspiring younger generations to engage in creativity, with Cam Town Art Gallery as his latest project. “Many of them do enjoy [creating art] and there’s a lot of healing and therapeutic elements that go into that kind of meditative work,” he said. Artworks on display are by former members of Living Arts Long Beach, a UCC program led by Syprasoeuth offering youth exposure to the arts. The artists are now a part of Living Arts Collective, a group of graduates of the youth program who have chosen to continue making art as a community. Dave Van Patten, a well known Long Beach-based illustrator and muralist who taught a comic drawing workshop for Living Arts students, also has several pieces on the wall. Syprasoeuth said Nak often buries herself in her drawings and tends to shy away from most interactions. But Nak seems happy while she’s creating; when asked if the character she was sketching had a name, she said she rarely names the imaginative subjects in her works. Inspired by Pokémon and other anime, she uses gel pens and alcohol-based Copic markers to create otherworldly scenes, including a sci-fi-esque caterpillar enjoying a day at the beach and a woman riding a hummingbird through gusts of leaves tinged with the colors of autumn. “She finds a nice escape through her work,” said Syprasoeuth. It’s no surprise that the new “gallery” is in a hallway within a community center. Artists and arts supporters in Long Beach are known for finding or creating displays in unlikely places, from underutilized storefronts transformed to makeshift showcases and pop-up galleries in spaces that will eventually be leased, to painting empty warehouses. Syprasoeuth, who plans to organize four to seven presentations per year, said he’s seeking out artists for the next show. Artists interested in showing their work can submit a short bio and five to 10 images of their art to [email protected]. The opening will take place on Friday, Feb. 8 from 5 to 7 p.m. Cam Town Art Gallery is inside the United Cambodian Community building, 2201 E. Anaheim St., Ste. 200. The show runs through March 8 and can be viewed during UCC’s regular hours, Monday through Friday, 9 a.m. to 5 p.m. For more info, check out the website here.